Learn how to make a Homemade Rotisserie Style Chicken right in your own oven. The absolute perfect alternative to store-bought rotisserie chickens with ALL of that great flavor. This homemade version is much healthier than store-bought and super easy to put together. There is a reason this Homemade Rotisserie Style Chicken has been the most popular recipe on Whole Food Bellies for about two years running. If you haven’t tried it yet, then get excited, because this is all kinds of delicious! 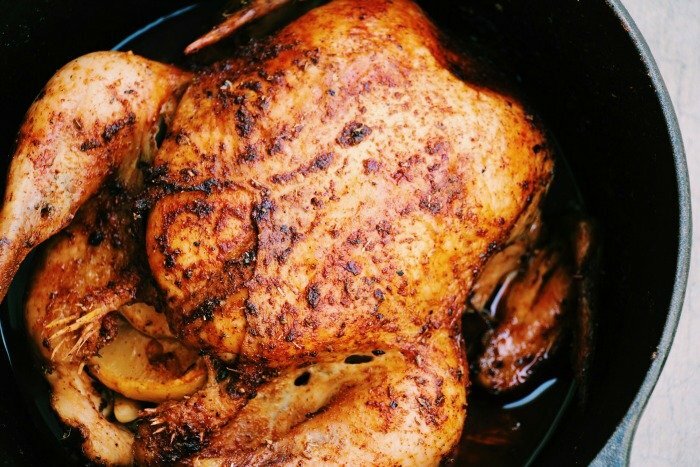 What Makes A Homemade Rotisserie Style Chicken Better Than Store-bought? I cannot emphasise enough how good this homemade rotisserie chicken is. Ok, so you have to cook it for around 3 hours….it is definitely not a quick meal. But really, if you are making a roast chicken, you aren’t anticipating a quick meal anyway. It usually takes an hour or so, but trust me, this one is worth the extra time. I promise. 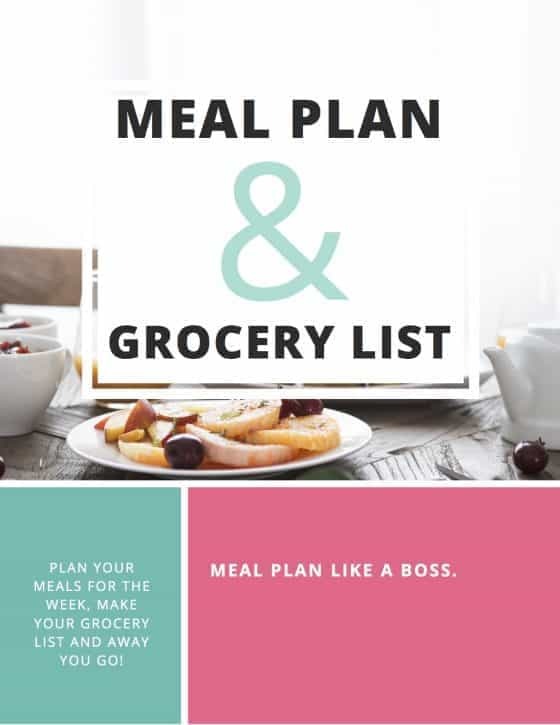 It is so easy, and it tastes so much better than the storebought version. Plus you just don’t know how long that store made chicken has been sitting under those heat lamps, or if someone has carried it around the store for a while, changed their mine and then popped it back. Gross. Throw it all in the oven and forget about it until the timer goes off! See? Told Ya! Not too much work involved at all. What About Prepping Ahead of Time? Definitely! In fact, dressing the chicken with the herbs and spices and trussing it up the night before let’s the flavors really sink in there. This way you just have to pop it in the oven on the night. Perfect. I don’t buy everything organic. I generally stick to the dirty dozen (read more about it here) which is basically those fruit and veggies containing the most pesticide residue. Then my dairy and poultry. There are usually a few other items, but these ones will always be organic in my cart. I justify the extra expense by using the chicken for 2 purposes. First, we enjoy it as a rotisserie chicken which can be used in LOTS of meals, and then I use the carcass to make the most amazing homemade chicken stock. How Do You Make Homemade Chicken Stock? Cool, strain and store in an airtight container in the fridge until you are ready to use it. 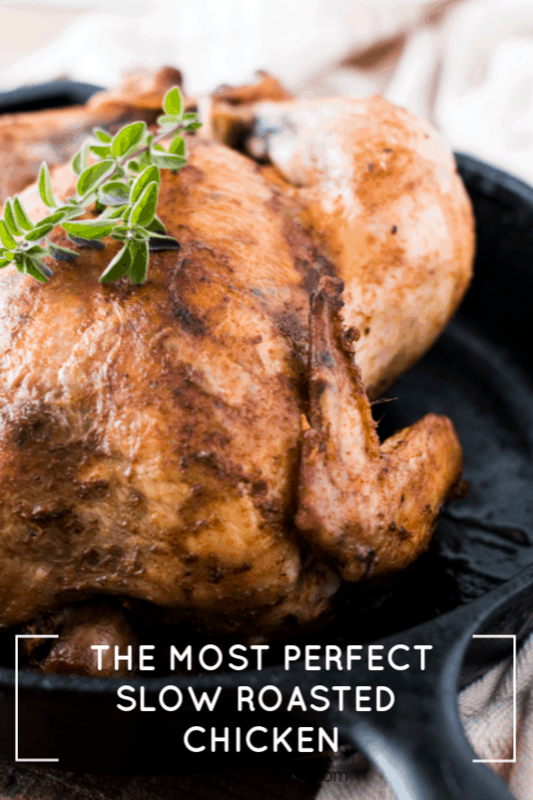 Do yourself a favor, next weekend head to the local Farmer’s Market, or wherever you get your chicken from, grab a good one and make this homemade rotisserie chicken. For a family of four, it fed us two dinners, a lunch and also made 8 cups of homemade chicken stock. What Do I Do With Leftover Chicken? Leftover rotisserie chicken is fantastic in sandwiches or wraps. It goes great thrown in a salad for lunch the next day and even better chopped up and thrown in some soup. If you make up your own stock then make a chicken noodle soup with that. Yum. Leftover Turkey Gumbo (but sub in rotisserie chicken) from Eating Richly. Learn how to make a Homemade Rotisserie Style Chicken right in your own oven. The absolute perfect alternative to store bought rotisserie chickens with ALL of that great flavor. This homemade version is much healthier than store-bought and super easy to put together. or in the pressure cooker on high for 10 minutes. I love this served up with some Lightened-Up Creamy Pasta Salad or Maple Roasted Small Potatoes and a fresh salad, like this Zesty Tomato and Nectarine Salad. I made the chicken the other night and it was amazing. I am in hot Australia at the moment so we swam all afternoon while it filled the house with delicious smells. Served with salad. Night two. Made pressure cooker (instant pot?) Risotto with peas and left over chicken. It was amazing. Going to try turning left over risotto into Arancini. All recipes from this great site. Will definitely try this recipe. Will a black enamel roasting pan work okay for this? What accounts for the amount of fat per serving – 42 grams! Won’t stop me from trying it though! Thanks! Ha, thanks for pointing that out Vickie! Those nutrition label calculators are notoriously inaccurate, which is why I didn’t use them for so long. I ran the ingredients again and updated 🙂 An enamel roasting pan should work just fine! This was a fantastic recipe. Did not have avocado oil so used olive oil and tasted delicious. Meat fell off the bone and the skin was nice and crispy! Ha I literally made this chicken again tonight too 🙂 So good!! I LOVE rotisserie chicken!! I buy them every now and then, I’ve never tried making it in the oven before. Us too, I can’t buy the store bought versions anymore though since we started making our own, they are so much better!! Love roasted chicken! It’s bring so much nice memories and this version would make nice memories also! I love the smoked paprika touch, it give it a rustic “done on the fire” flair! This crust and seasoning looks delicious! Oh thank you Marie! It is definitely a favorite around here, especially with the kids!! I love a Ggood ood roast chicken. I’m excited to try your version with a lower temperature a longer cook time than what I am used to thanks for sharing. this chicken looks amazing and the perfect way to cook a chicken for the family or for friday night dinners. I love making some roast chicken on Sunday night, and then eating the leftovers for the next couple days. This one looks delicious, so I will definitely give it a try this Sunday. What’s your favorite way to use the leftovers? Has anyone tried this in an enamel coated cast iron dutch oven? I once tried to roast a whole chicken in my cast iron skillet and it splattered everywhere in the oven. Does the dutch oven prevent that? I make this one in the cast iron dutch oven (not enamel coated) and I have never had an issue with splatter. I think the sides are high enough that it keeps everything in the pot so it shouldn’t be an issue! I am not familiar with avocado oil. Do you have to buy it in large quantities? I suspect I would probably never use it other than for this recipe. Or, do you have another good substitution idea? Thank you so much. I have never made a chicken like this by myself at home and I am excited to try. Hi Galen, you can just use olive oil (or any other cooking oil of choice) as a replacement, with no problems. Avocado oil comes in bottles about the same size as olive oil, and it can be used in any high-heat cooking. I use it in everything, but I know it may not be as easy to come by in some areas. I hope you love the chicken 🙂 It is a firm favorite around here! Oh yay, thank you so much for stopping by to let me know Kim!! Haha I actually made this yesterday, and we had it in some tacos – definitely makes the house smell all kinds of amazing 🙂 I hope you guys enjoyed. LooKing pretty good! I was hoping to see a rotisserie recipe! They exist for bbq and I’m doubting to buy one! Ha that’s so funny, I literally went out and bought a chicken this morning so that I could pop one on the bbq tonight 🙂 I can’t buy rotisserie chickens anymore, homemade tastes so much better! I have a 5lb chicken what should i preheat my oven to abnd for how long? Sorry Nicole, I only just came across your message, hope you weren’t planning on cooking it tonight. I haven’t worked with a bird that big, but I would stick to the temp in the recipe, and just leave it in for an extra half hour or so! I never post on blogs, but this was the most amazing chicken I’ve EVER made. I was making one for dinner tonight and ended up pre-eating and explaining to my husband why part of dinner was in my belly! Seriously, thank you so much for this recipe. Haha thank you so much for taking the time to comment Tiffany! You just gave me the biggest belly laugh of the day, I have so been in that situation before 🙂 Glad you loved the chicken, it is still one of my favourite recipes, and I can’t even count the number of times we have made it! This is in the oven right now and my husband keeps commenting on how delicious it smells! I can’t wait to try it 🙂 Thanks for the recipe! Oh yay, I hope it tasted as good as it was smelling for you! I actually made this for dinner on Saturday night for some friends coming over, and the first thing they commented on when they arrived was how good the house smelled 🙂 Thanks for taking the time to stop by and let me know. I made this for lunch today and it was delicious. I used regular paprika because that is what I had on hand, and bacon fat instead of oil because I had cooked some bacon for breakfast. I used an enameled cast iron dutch oven and it came out splendidly at 2.5 hours. The seasoning was perfect and the meat was falling off the bone. I don’t typically eat the skin, but if I did, I would probably have turned the oven up to 450 or so to crisp up the skin a bit at the very end. I would have never thought to have roasted it in a dutch oven, but it is so much easier than a roasting rack that I typically use! Thanks for the suggestion! Oh I am so glad you loved it Elizabeth! Thanks for taking the time to let me know 🙂 We make this probably once a month – and we really enjoy it every time (especially seeing as it is so easy)! 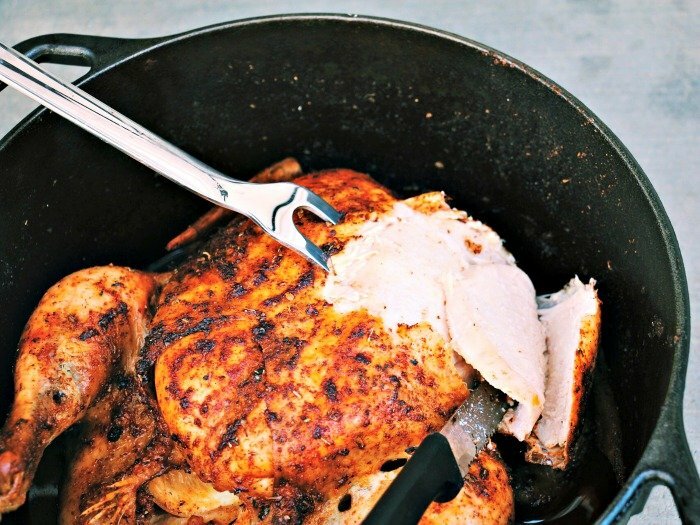 Should you cook it with the lid on if you are roasting it in a Dutch oven? Hi Sue, I have only ever cooked it in a cast iron dutch oven, and it works perfectly every time with the lid off. I haven’t tried any other type though! My apologies, but what temperature is “roasting” in an oven? Spices and orange wedges definitely boost the chickens’ flavor! Oh I haven’t tried it with orange, but I can imagine that would taste fantastic as well Krystallia! I love the spices you used on the chicken and making your own is so much better than buying one – great recipe! I am so pinning this recipe. I love the way rotisserie chickens at the store look and they smell delicious, but there’s just something about them being in those cases for hours that makes me wary, so I never buy them. Oh I know Amy, the thought of how long they have been in there, and what is growing in those cases, is enough to make me feel sick – but they smell so good!! 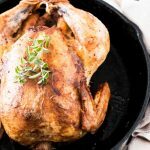 My husband makes a great roasted chicken, but I am always game to try another recipe and yours looks great! And I hear you on timing…I posted a buffalo chicken grilled cheese yesterday that I meant to post last month during Grilled Cheese Month! Thanks for sharing your yummy recipe with us at #FoodieFriDIY! Sharing! Thanks for having me along for the fun at #FoodieFriDIY 🙂 Haha that definitely sounds like something I would do – that sandwich sounds amazing though, I will have to check it out. Thanks for stopping by! OMG! I love whole chicken and I am going to make this…this weekend….on Saturday of course because there will be no cooking for me on Sunday! It’s the only day of all of the year that I get to do absolutely whatever I damn well feel like! Thanks so much for sharing with #momsterslink and I will be sharing on my social media as well! This looks delicious! I will be making this over the weekend! I hope you enjoy if you give it a go Mary! Oh I hear ya Annabelt – someone else cooking for a change is always nice! Oh and if you do get some avocado oil – I just use it everywhere that I would normally use olive oil for cooking at high temps! This looks amazing! Also, great job on getting scheduled ahead. I am really trying to get better at that. I’m going to try this recipe for sure! Thanks Christina, yes I have been trying with the scheduling thing for a while but it’s just not me apparently 🙂 Hope you like it if you give it a go! This is such an awesome recipe an I needed a good Rotisserie chicken recipe! This sounds seriously amazing! I need to get on this ASAP! 🙂 Can I leave the recipe out and maybe my husband will make it for me on Mother’s Day!?!?! yum! This is my husbands favorite!! Definitely adding this to my menu this week! Sounds easy and delicious! You are very welcome Meg! Ok, I shouldn’t have read this before lunch! Looks amazing. I’ve never made a whole chicken myself – but this sounds so easy, I might actually try it! Uh, YUM. Going to have to try this soon! I hope you do Heather! I have never roasted chicken at home before but now I want to give it a try. It seems like it’s a lot easier than I imagined. I would definitely add lots of cumin. Cumin is my favorite! This looks so good! I’ve never put seasoning between the skin and the breast meat of the chicken. That is definitely a tip I’m going to try. And I think this would be easy enough for my hubby to do for Mother’s Day! Totally easy enough for him Aliza! If my husband can do it, anyone can 🙂 I only recently started putting the seasoning between the skin and breast and it really makes the world of difference! Good luck with Mother’s Day! This looks so good! I love that it can be used for more than one recipe – cook once eat twice – my fav! 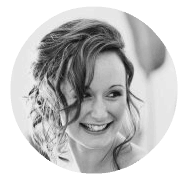 My favourite too Brittany – anything that spreads over more than one meal is good in my books! I am going to try this for my boyfriend, he would love if we could figure out how to make a whole chicken that he would enjoy! Oh I hope he likes it Sam!! I was looking for something like this – so thank you. AND by the way, I just LOVE the name of your blog. Perfect. Ohh this sounds amazing!!! Thanks so much for sharing. I’m excited to try this out! You are very welcome Lindsay, I hope you try it! Wow this looks so YUMMY! I love rotisserie chicken! Thanks for sharing, your pictures are great! Oh I’ll have to give this combination a try. You can’t beat a roast chicken dinner.. Yum!! I hope you do Jackie!